Laser Relativity Satellite, a 390 kg, 0.38 m diameter tungsten sphere covered with 92 laser retroreflectors. Used to probe relativistic effects in the Earth's gravitational field. The satellite had the lowest ballistic coefficient of any satellite ever launched. Italian Vega launch vehicle. 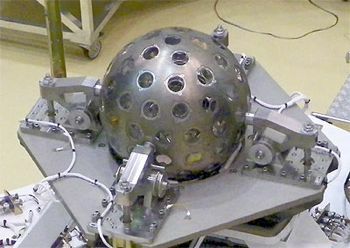 Basic research, Geodesy satellite built by Carlo Gavazzi Space SpA for ASI, Italy. Launched 2012. Status: Operational 2012. First Launch: 2012-02-13. Last Launch: 2012-02-13. Number: 1 . Gross mass: 390 kg (850 lb). Apogee: 1,452 km (902 mi). Family: Earth. Country: Italy. Launch Vehicles: Vega. Launch Sites: Kourou ELV. 2012 February 13 - . 10:00 GMT - . Launch Site: Kourou. Launch Complex: Kourou ELV. Launch Vehicle: Vega. LARES - . Mass: 390 kg (850 lb). Nation: Italy. Class: Earth. Type: Geodetic satellite. Spacecraft: LARES. USAF Sat Cat: 38077 . COSPAR: 2012-006A. Apogee: 1,452 km (902 mi). Perigee: 1,436 km (892 mi). Inclination: 69.50 deg. Period: 114.80 min. Laser Relativity Satellite, a 390 kg, 0.38 m diameter tungsten sphere covered with 92 laser retroreflectors. Used to probe relativistic effects in the Earth's gravitational field. The satellite had the lowest ballistic coefficient of any satellite ever launched. First launch of the ESA/Italian Vega launch vehicle.